those remarks(by LKY) and remain so".
" No Singaporean must ever feel alienated, or worse, marginialised." Is LKY to be blamed for PAP loss in Aljunied? zone) even once in 5 years. SINGAPORE - While Minister Mentor Lee Kuan Yew felt that his remarks about Malays, Muslims and integration did not affect the Malay vote for the ruling People's Action Party (PAP), Senior Minister of State for Foreign Affairs Zainul Abidin Rasheed said yesterday: "You need only ask the Malays and Muslims in Singapore - many were hurt by those remarks and remain so". Mr Zainul, who was a member of the PAP Aljunied GRC team which lost the General Election (GE), made this point to "show how easily the knots of racial harmony in our community can unravel". "Integration does not only mean living in harmony. There must be equally opportunities for all ... No Singaporean must ever feel alienated, or worse, marginialised," he told reporters yesterday. Asked about the timing of Mr Lee's remarks, which were published in the book Hard Truths to Keep Singapore Going, Mr Zainul pointed out the remarks had been made two years ago but as the book was only published earlier this year, he acknowledged: "So in that sense, (the) timing was bad for the GE." Published by Singapore Press Holdings, the book is based on 16 interviews with MM Lee done by journalists from The Straits Times. It was launched about three months before the General Election. However, Mr Zainul admitted that there "is no such thing as good timing or bad timing" to discuss potentially sensitive issues "because it sometimes touches on the raw nerves and this is where we have to manage the way we discuss such potentially sensitive issues, and issues that could also be divisive". He also pointed out that some "very sensitive issues" pertaining to the Malay-Muslim community - such as National Service, tertiary fees and quotas in public housing - had been previously discussed behind closed doors and in public. "I think it's the combination of the approaches we have taken that has brought the community to a level of maturity and be able to face these issues squarely, and then move forward," he added. Unlike his PAP team mates, Cabinet Ministers George Yeo and Lim Hwee Hua, who had announced their retirement from politics earlier this week, Mr Zainul, stopped short of saying as much. "I will always be involved in community work and I can never say, 'never', in life or in politics," the 63-year-old said. "But given my age ... I think it is unlikely for me to stand in the next election." While various PAP leaders have spoken about the need for reform from within the ruling party, Mr Zainul noted the transformation "is an ongoing process". He also recounted some of the changes which he had witnessed within the PAP. As an editor with the Singapore Press Holdings between 1976 and 1996, Mr Zainul remembered Mr Lee - then Prime Minister - would consult many editors before important decisions and speeches. "We found that if we do our homework and we were sincere in giving our feedback, in fact, Minister Mentor was even willing to change decisions which they had already made," Mr Zainul said. When Mr Goh Chok Tong took over as Prime Minister, Mr Zainul pointed out the PAP Government tried to make the political process "more consultative" and "open". 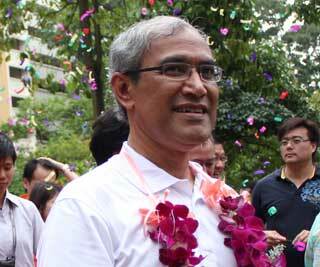 Similarly, Prime Minister Lee Hsien Loong is "more engaging and prepared to listen", Mr Zainul felt. But he pointed out: "We have leaders among ourselves, or even in the civil service, people who have strong views themselves, who have their own opinions, and it's a matter of how do we actually blend the opinions, positions and feedback, and how do we bring them a policy that is acceptable to all." While the Government "cannot please everyone", Mr Zainul felt it could do better in managing the communicating policies, managing feedback of people that may disagree with the Government and the communication process. "This is something which I think the party has started doing it, and I think we can only go deeper and do more," he added.